I love the random magazines that cover the tables of waiting rooms. As an advertiser/marketer, I usually pick the magazine furthest from my demographic just to see the types of ads. This time I chose Coastal Living, a magazine about coastal destinations and home decorating. I’m guessing their demographic is somewhere around white women ages 35-60 living by the coast with an income of 60k+. This terrible print ad comes to us from Toviaz, a medication for overactive bladder. Here we see Toviaz trying to take advantage of the popularity of iPhones and catch a reader’s attention. Nice attempt at trying to be current and interesting. Overall, a decently laid out ad. 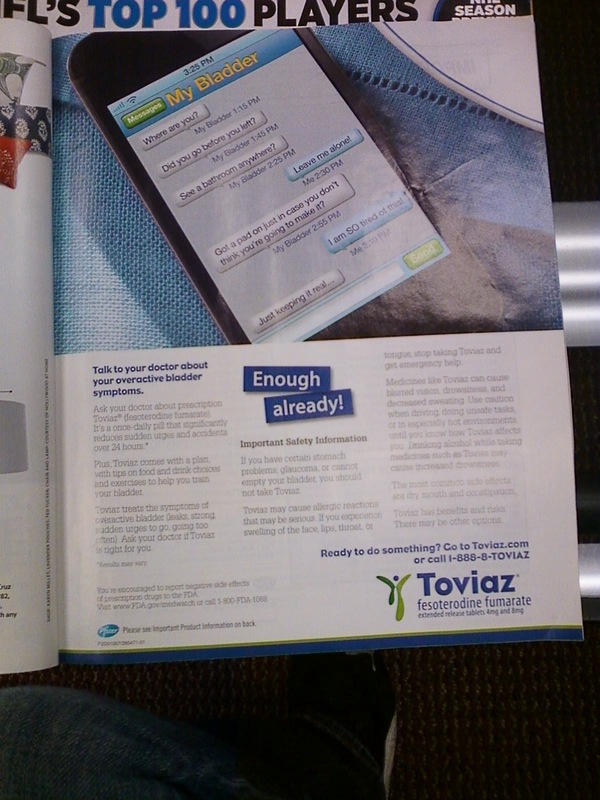 Unfortunately, Toviaz somehow thought a text message conversation between a person and their bladder was humorous. I understand the need of pharmaceutical companies to lighten the mood and make medications and medical issues something to be talked about, but this ad comes across as plain silly. As a normal human being, I generally glance over my texts, but rarely read every line in depth. This ad assumes that people will read every line of this text message. It also assumes that the reader is interested in having a conversation with their bladder when all they really want is a simple, invisible solution. Now let’s talk about the language. Earlier I mentioned the demographic of this magazine. Assuming that a person has enough money to take these trips and decorate their homes, we are not talking about low income families or teenagers. “Just keeping it real….” is NOT the type of language used by their target market. My bet is that this language is rarely even used by their preppy children. Oh boy Toviaz. You need some help. Overall, the ad does a decent job of telling the reader what Toviaz is, the goal of most medical advertisements, but did a terrible job at it. Back to the drawing board!